In 2013 Turner Prize winner Steve McQueen launched a new work that was seen in thousands of locations worldwide and subsequently earned over $120 million. However, the work was not seen in the gallery, but rather in the cinema. McQueen’s 12 Years a Slave is a powerful work of visual art that represents a breakdown of the barriers that have traditionally separated the gallery and cinema spaces. McQueen’s film contains a particular element that is characteristic of the form, and which galleries have historically been ambivalent towards—narrative. In my own artistic practice I’ve often come up against an indifference to narrative. Despite my early work looking at the very idea of narratives, I unconsciously resisted making work that embraced a storyline. As sculpture and collage, the work remained static. Once I did start working with narratives, friends would watch the videos I was putting together and nonchalantly ask: “Is it actually art?” I was interested by these reactions, and the reasons for them became even more intriguing once I began to investigate the historical relationship between the gallery and narrativity. Why do movies get shown in cinemas and not in the art gallery? Painting, drawing and sculpture (the traditional static arts) were in upheaval in the early 20th century. They turned to themes of movement, dynamism and technology. It was at this time that film and the movie appeared, a medium and form that seemed to embody similarly modern themes. Yet with little exception, film evolved separately from the input of the turn of the century’s visual artists and the galleries they served. The gallery could have been the ideal home for the new art form of the movie, but it was not to be. Recent events seem to suggest a change is underway, but first we must look at the origins of movies in order to understand why it was not always so. The divide that separated the cinema and the gallery is perhaps related to the circumstances of film’s origins: it was of a lowly birth. Movies developed out of the kinetoscopes, zoopraxiscopes, electrotachyscopes and stroboscopes of the fairground, vaudeville acts and travelling entertainers. The movie was the child of carnival folk. Movies were created for our entertainment. They were, more specifically, crude entertainment. Film’s earliest incarnations consisted of mainly single scenes and short gags: the Lumière brothers were having fun as early as 1895 with films like The Mechanical Butcher, where a pig goes into a box and emerges as pork. Many others were playful experimentations with the medium – double exposures and other optical tricks designed to please its viewers. Demolition of a wall, again by the Lumière brothers, was made for the simple enjoyment of seeing a wall collapse in reverse as the film was played backwards. After these early gag reels, it was with remarkable speed that film then developed its own syntax that evolved into an art of storytelling. Film incorporated both narrative and popular entertainment in the format of the movie. Cut to the static visual arts during these early years of film and we find it as anything but conservative. Subject matter was rapidly expanding, while the art world’s sensibilities were being continually shaken. But with its newfound love of narrative, film didn’t stick. A few artists made forays into film in a movie-like manner, a notable example being the surrealist film Un Chien Andalou by Luis Buñuel and Salvador Dalí, but most static visual artists did not embrace the medium. Whilst the modern era was characterised by artists experimenting across a range of media, they shied away from film. This could have been due to economical reasons, since film was expensive to produce, but it was also perhaps due to another reason; what I deem the gravity of the static arts. The gravity of the static arts isn’t physics. What I mean to suggest is that the static arts have been held captive by an element of language in the same way that film and cinema had quickly latched onto narrative. The gravitational force behind the static arts is the metaphor. We take what we see in the static arts and, of course with exception, probe for what the meaning might be. Few works are taken for their face value and their static images become metaphor. In addition to the prevalence of metaphor, the gravity of static arts comes from the prescriptive use designated for the gallery space. The art gallery was a place of quiet reflection, and not of entertainment. This force stopped movies from being displayed in a gallery setting. What the gallery expected from art was the attentive contemplation of its audience, and the metaphor provided this. A metaphor depicted through a pictorial or sculptural form needs to be sought out and interpreted. This is in contrast to the narratives of early films, which were typically spoon-fed and easily digested. It wasn’t until the 1960s that the moving image was regularly shown in galleries, with artists such as Nam June Paik at the vanguard. But the work that appeared in galleries did not resemble the movies: it was video art. Video art seemed to resemble film in its early years, as it was highly experimental. It explored the possibilities of developing its own language. However early video art generally omitted narrative. Instead it used repetition, slow motion, silence, white noise and single shot imagery – much of video art still uses this grammar. It is a language geared towards a reflective contemplation of what is being seen, in much the same way a painting or sculpture provides. It is the gravity of static art. Whilst being a provocative piece of writing, perhaps there is some truth to this. The video artist Douglas Gordon has crossed over to the world of cinema, and one of the most acclaimed movies from the 2013 Berlinale Film Festival, Das merkwürdige Kätzchen, is by Ramon Zürcher who is an artist with a background in video and painting. Closer to home, the painter turned video artist Heath Franco has turned his attention to a cinema-style gallery installation, replete with stage curtains and surround-sound for Home Town at Galerie pompom. 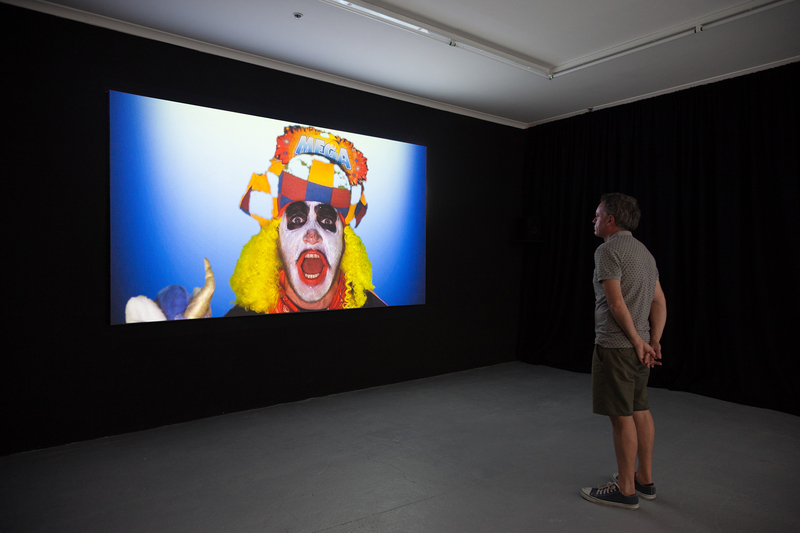 Heath Franco, HOME TOWN (installation view), 2014, HD digital video, colour, stereo sound. Duration: 9 minutes 29 seconds. Courtesy the artist and Galerie pompom, Sydney. Photo: DocQment. Perhaps as the historical wall that existed between the cinema and the gallery is being demolished an opportunity awaits—not only for new art audiences, but also for new narratives to fill our screens and thoughts.